It's late and I just want to post this before I go to dreamland. 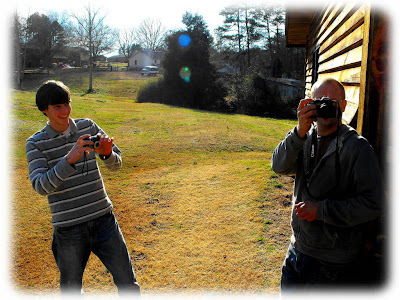 But I will fill in the blanks about my trip to Seagrove, NC and answer any questions that these pictures might raise. Just leave a comment. I look forward to the exchange. Don't be shy. the reason I wanted to remove my Shimpo wheel head. Tonight, I celebrate little victories here at the pottery. 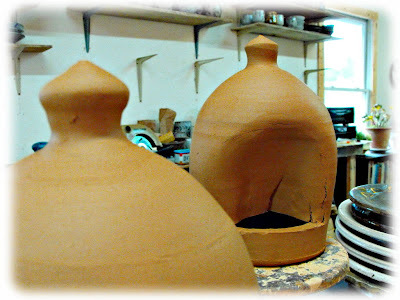 After taking a few days off to travel to Seagrove and visit with the cousins, I got back in the shop to...... make pots? NO! More carpentry, of course. I've been wanting to build a new and more roomy ware rack to handle all the all pots I work on during a firing session. handy for drying towels, too! Here it is in all of it's glory. It's moderately stable. Just needs some lateral support. Perhaps I'll add some ceiling support. After some adjustments to the depth, it works relatively well. (Just needs more pots!) I'm planning on a rack to handle smaller pots next door to this one, maybe next week when I get the urge to taste more piney sawdust. After shoveling some snow this afternoon, I made it up to the shop to start a fire in the wood stove and get going on some pots. Something, anything! So it was a board of mugs. I don't know about you, but I'm always interested in the origins of phrases, sayings, figures of speech. Especially if it's something to do with pottery making. So, where did the term mug shot originate? Follow this weak link and decide for yourself. If anybody has a better origin, please comment to the effect. These mugs certainly take on the characteristics of faces. At least in my eyes. Do you see? 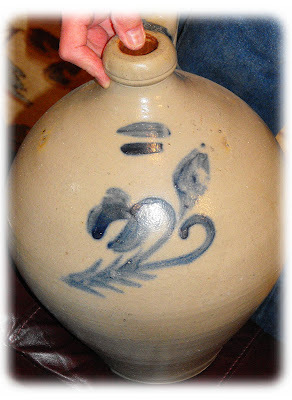 In Catawba Valley pottery traditions, handles were often called "ears". I've never heard of handles being referred to as noses, but that's what I'm seeing in these pictures. 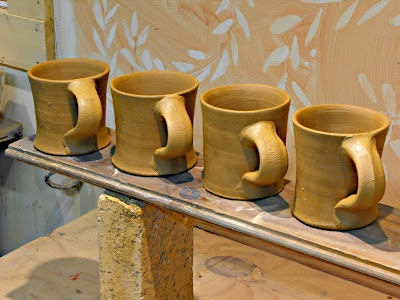 Come Sunday, these mugs will get dipped in some kaolin slip and get combed. Tune in tomorrow for that and hopefully I'll have my Seagrove/Cousins post edited and ready for your consumption. Bottoms up. This strange pot is evolving slowly. But I'll bring my camera and let you know what everyone is up to. Check in later this week for the Seagrove report! Hope you're getting the pots made or getting the pots that are being made. All for one and one for all! I put this sign up in studio after a morning of putzing around, putting things away, ETC. I think I'll leave it up for a while. Feel free to download and print this out for your studio wall. Or load it onto your smartphone! I'm feeling much better and even managed to split a truckload of firewood. Unfortunately as I take a little break to pause and reflect and have a Saturday afternoon candy break with the girls, the cord wood is still in the truck. As our wood pile has been getting down to nothing, it's good to know that we have some wood ready to burn. So, here are a couple of pictures of the pots I made last week! I tried to get over this cold ASAP and stayed in bed for two days and feel fine now! Usually I try to work through a cold but it tends to hang around longer as a result. Now I'm ready to head in there on Sunday and get back to pottery work. 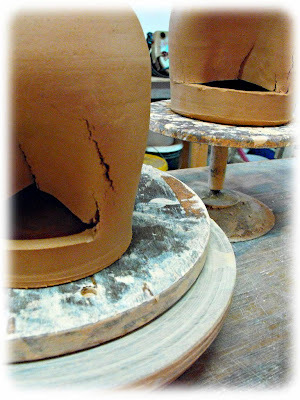 As you can clearly see, these two pots were too dry to reshape. To create the reservoir where the chickens can peck their little heads in for a cool drink of water, I cut the pot with my fettling knife parallel to the base and push the side of the pot in. 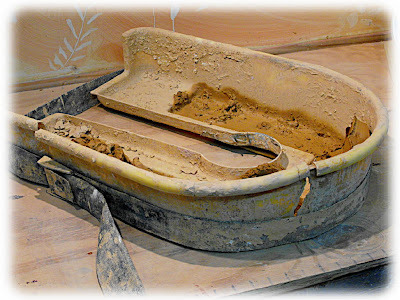 I think I should do this when the clay is still a little softer, d'ya think? 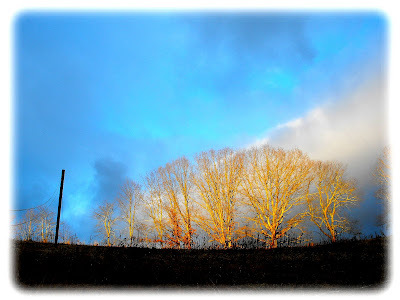 Took a nice walk with Jack and my family and the sky opened up in the late afternoon. What a difference a day makes. 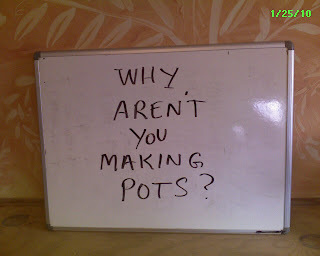 Maybe I'll make some pots in the morning?! Another day in the sick bed. I'm feeling a little better than yesterday. 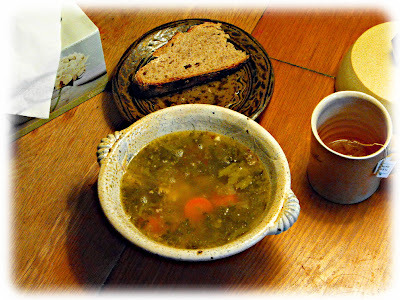 Stacey made this delicious chicken soup, and paired with my rye bread and tea, they're making me bounce back from this cold. Maybe I should go check my chicken pots before they burst? Since they are closed forms, when they dry they shrink and the air inside of them gets compressed. But they tend to dry slower than the average pot since they are closed. I'll let you know how things go. Don't ask me why I feel compelled to make a catchy title when I sit down to write to you. It's all part of my "foot-in-mouth" disease. Sir James and the Bug are having Earl Grey and me too. It's the same kind of day here. We're not far from Louisville, after all. I feel like crap this morning and managed to get a couple of orders packed and shipped out using the every ounce of a.m. energy I had. Now I'm back to my snifflingsorethroaty self and wondering what I'm going to do with all that fine clay mixed and ready for action! on what would normally be a great day to make pots, a gray drizzly day. 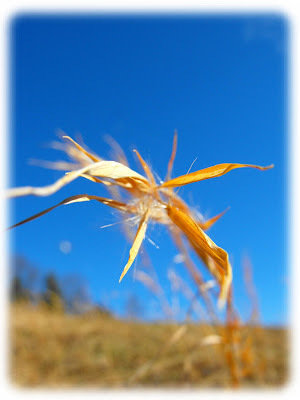 These kinds of days are great for focus without the distractions of a bright sun shiny day. I hope you're getting things done today. 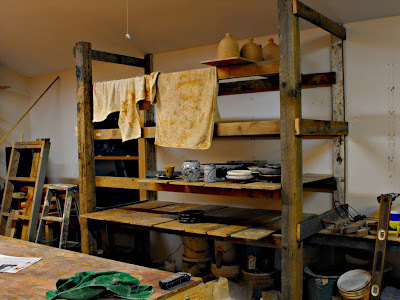 I managed to sort out the clay, clear the decks and make a few pots. Ever since the recall of the chicken waterer, I've been painstakingly refilling my chicken's plastic water bowl. Now that it's warmed up the water isn't frozen 5 minutes after I bring it out! And!! Thanks to my neighbors Marissa and Lindsay, our rooster, Pavement, now has a girlfriend, unnamed at the moment. We hope they have a family! More about the happy couple later. I'll sign off and hit the sack. Maybe I can fend off this cold with a good night's rest. This just in from Bryce Brisco up Ohio way, relating to the link in my post the other day. Check out Bryce's work, pretty good stuff! I'm looking forward to reading more from Crocker Farm ! I'll add them to Ye Olde Blog Roll! Thanks so much Bryce. 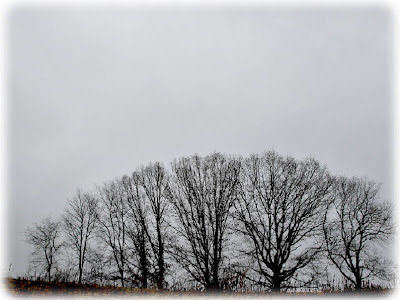 A quiet gray day here at the pottery. 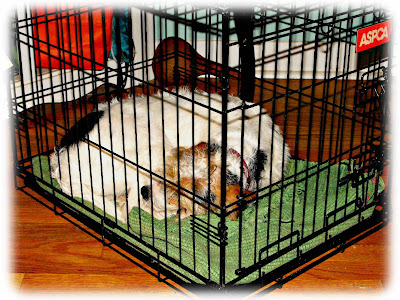 Jack is snoozing in his box as I write this. Thank goodness he doesn't snore! 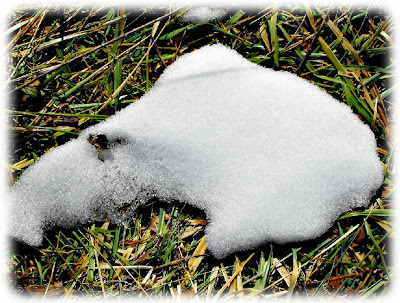 (yet) Clay is thawed, mixed, and pugged. But first there were taxes to finish and still a layer of fine sawdust on everything in the shop to rid before I start to spin. Aaaaaa, what's a little fine sawdust wedged into my clay! This morning, before I head up the hill, I'm planning a trip to Seagrove. Next week I'm meeting with my "cousins" to plan our show (June 5, 6th!!!) 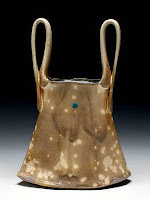 and was also checking out the NC Pottery Center to make sure they would be open so I could see the current show (Fire in the Valley: Catawba Valley Pottery Then and Now). I'll take my tripod and take some pictures for you when I visit. I'm also hoping to see cousin Ron over Shelby on the way! I also checked into Mark Hewitt's web page to see if there was anything going on over on Johnny Burke Rd. and found this. Related to yesterday's post, Mark puts it in simple concise language, as only Mark can, "...take what you've learned and add to it." 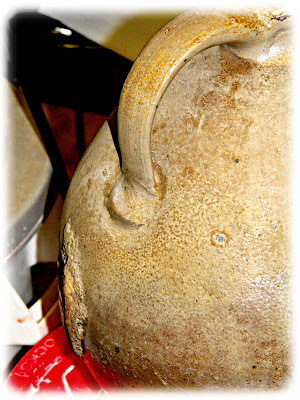 If I had taken more notes and been a better student I could then pass on more information to you about the pots in this post. But as it stands, it's been over a week since I visited Tom and looked at these pots and I didn't have my notebook with me. One important thing that happens, though, when handling pots or objects of any kind is a sort of downloading of non-verbal information. Textures, weights, shapes become internalized and this data is kept in hand memory and visual memory. We become scanners and cameras as we handle and turn these objects. You don't have to be a potter to do this. All of us handle hundreds of objects every day. Our relationship with any object is the product of these sensory interactions merging with our own needs and desires. We need a cup of tea or coffee, we desire that particular cup. 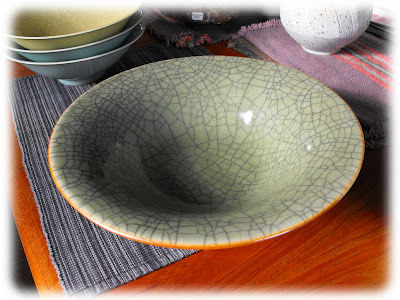 The necessity of food and eating for survival is the primary job for which pottery exists, the culture of that pottery is lead by our desire for function and style. 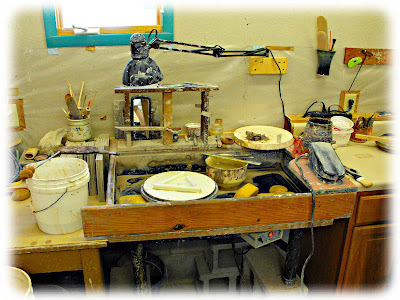 The available technology at any given time in history is the catalyst for expression in the art of the potter. Although I don't consider myself a scientist, I am infinitely curious. 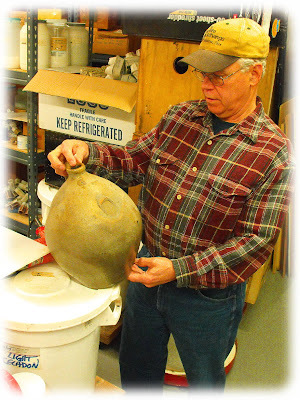 This curiosity leads me to answer questions that I have in my work as a potter. 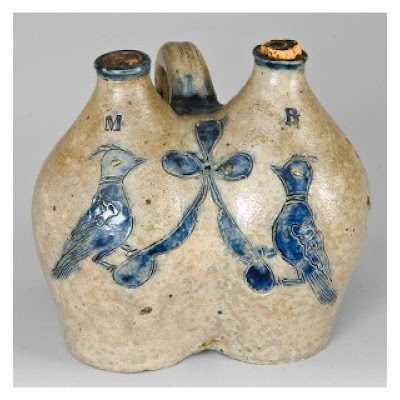 As a contemporary potter I am fortunate to have examples of previous potter's research available in collections like Tom's, like the Mint Museum's, and others, like the Freer/Sackler. In any research discovery stands on the shoulders of the past. Unfortunately, a lot of what I do in the studio is redundant in the search for these answers. I'm not sure, yet, how to minimize this. But continuing to study is crucial. 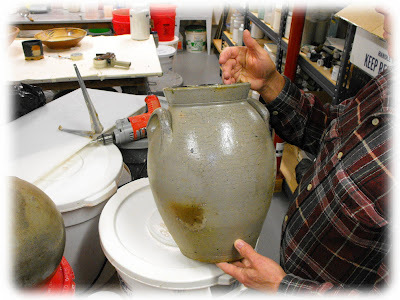 No matter if you are making pottery or sculpture, no matter if you are new to clay or a veteran, it is essential to the success of your work to know the history. We may be doomed to repeat the failures of the past, I know I have, but we can also enjoy the satisfaction of perpetuating good ideas and good forms with our work. 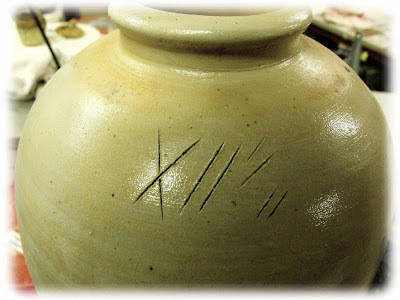 I meant to talk more specifically about the marks on some of these pots, but I've gone on a tangent. 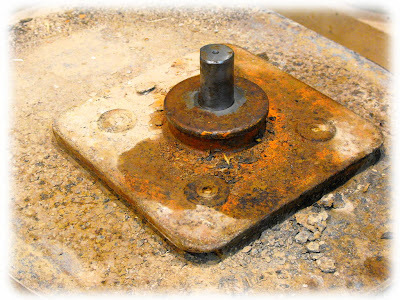 Last week, Tom and I were were looking at handles, their attachments, and capacity marks. 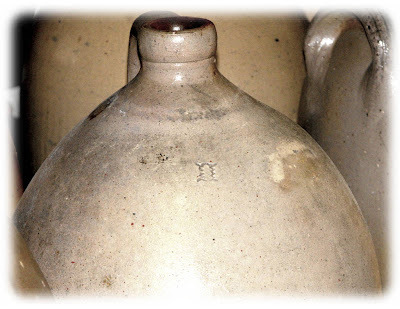 These images show a few ways of marking and embellishing. In the process of answering questions about these pots we learn about the needs and desires of the people who made them and the culture that surrounded them. 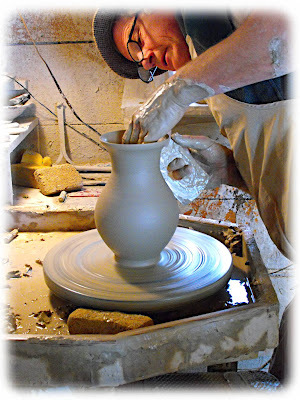 In turn, we learn about our own needs and desires, both as potters and as people. Thanks Tom for sharing. 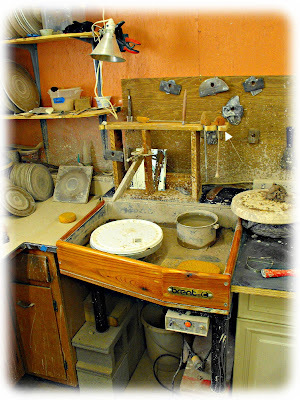 I'd better get myself in that studio and make some pots today! Thanks for indulging. 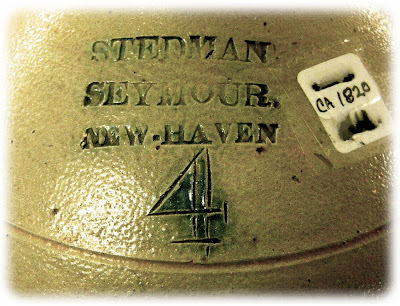 ***Click here to see another Stedman/Seymour pot you might find very interesting. I can't imagine what it was for or how it might have been used. Maybe you have an idea? I'm gearing up to make some pots and wanted to start my day off to a good chocolaty start. 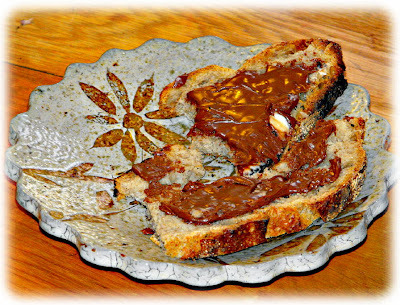 This reminds me of staying with my Oma in Munich, Germany so many years ago and having Nutella for breakfast, on rye bread! I've gotten back into baking this daily loaf just recently. My recipe is based on this recipe, but instead of 3 c. of regular flour I use 2 1/3 cups all purpose flour and 2/3 c. rye flour. Then I add a liberal amount(3 T) of caraway seeds/fruit (less if the girls are eating the bread, although they are developing a taste for the caraway). I hope you're off to a good start to the week. 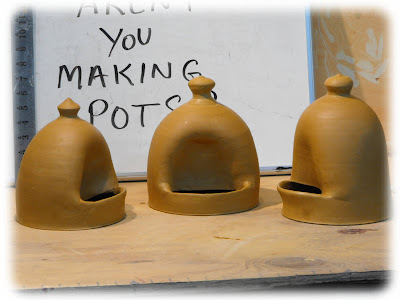 Let's make some pots! 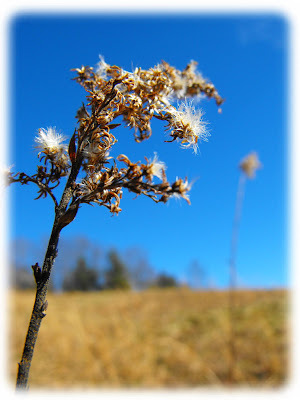 The air was warming and the sun was so bright on our walk the other day. 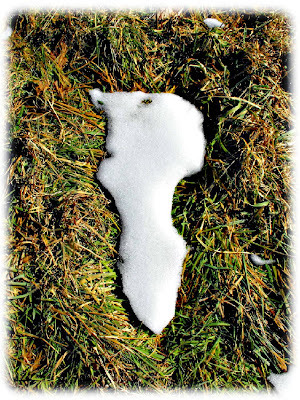 You could hear the ground thawing and percolating. Jack and I were getting muddy for the first time in a month, unusual for these parts. 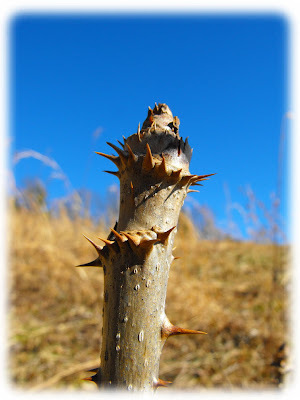 I had my camera with me as I often do on our walks and tried to capture some of the things I was seeing. 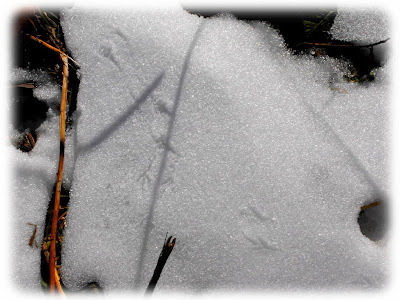 Although I rarely use imagery in a representational manner, I am always looking at nature and patterns in nature. It's endlessly fascinating. 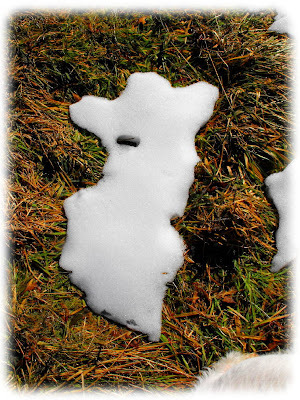 The 15" of snow that fell on the 18th of December was slowly soaking into the field and leaving these beautiful shapes. 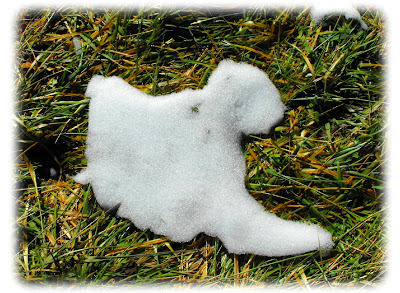 It was sort of like laying on your back and looking at clouds, something I remember doing often as a child. 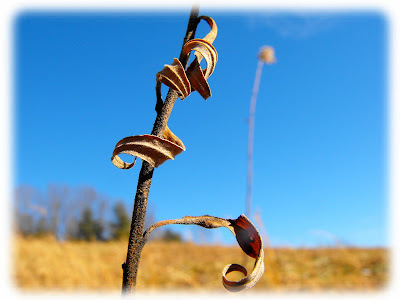 Except I was stalking over these looking for interesting shapes. Here are a few of those. If someone had seen me from a distance they might have thought I had gone crazy, hopping around in the middle of the field taking pictures of the ground. I'm sure jack was wondering himself what was going on! Please indulge my captions. Let us know what you see. As always I love your comments. Don't be a stranger. Click here for today's blast from the past. 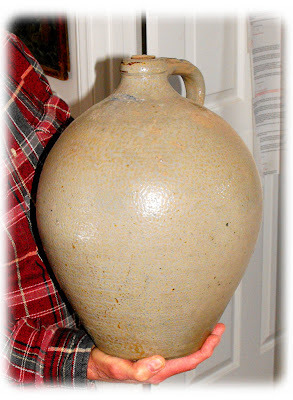 From this post onward, I'm dedicating my mystery pot posts to potter/blogger Brandon Phillips from Support Your local Potter, who is usually the go to guy in "name that potter". This pot was spotted at Cynthia's studio last night. It's a beauty and CB has lovingly repaired it after is was broken. It's from the mid 80's. Can you name that potter, Brandon? Anyone? 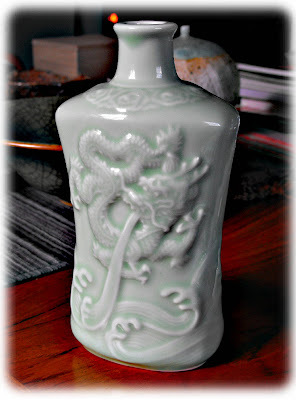 Tom came back from his stay in Jingdezhen, China last month, but it was a busy time for me and I couldn't get over to see him and the pots and books he brought back until Monday. Tom's house is jammed packed with pots from all over and he's always getting new pots from his travels or from eBay. Here are just a few of the pots Tom brought back from China. I've already shared one with you all earlier today. 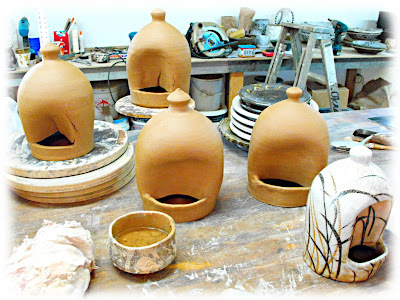 Saggars are boxlike containers made of high fire clay or specialized fireclay which are used to enclose pots needing special treatment in the kiln. The word "saggar" is thought to have come from the word "safeguard." 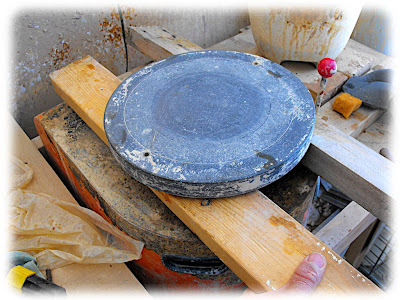 Historically, reusable saggars were used to protect or safeguard specialized glazes from open flame, smoke, gases and flying ash present in wood fired kilns. 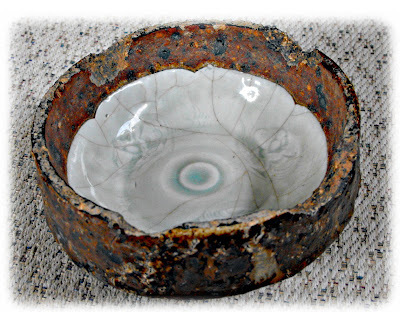 This technique was used to protect the surface of pottery in ancient China, Korea and Japan, and was popular in the industrial potteries of Great Britain. 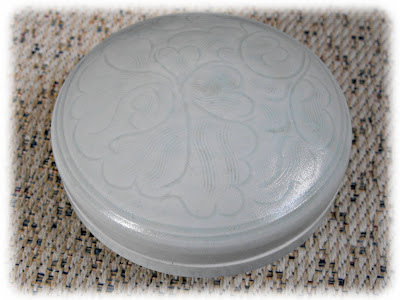 Saggars are still used for industrial ceramic production, shielding ware from variations in heat and kiln debris. 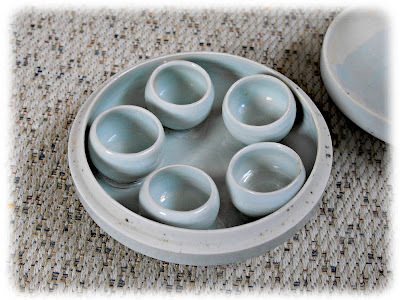 The next piece is curious in that is is considered a "disposable" container in China. It contained wine and these pots are very inexpensive to buy. Tom says that the factory claims to make 5000 a day! 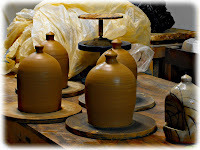 Look here to see a picture of a simple device they use at the factory to glaze the bottles quickly. 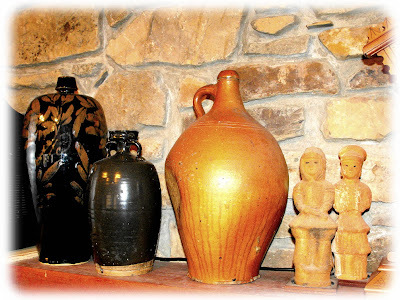 Above Tom's fireplace I found this nice group of pots. From China on the left to Germany and then over to Japan for the figural pieces which I believe are Haniwa. I should have taken more notes so that I could tell you more about these pieces. Usually Tom doesn't leave comments! but maybe he'll chime in for the sake of accuracy (which he's really into, and good at) and set the record straight. I love the painting on the bottle on the left, the handles and lip of the solid black bottle, and the big dent in the jug. 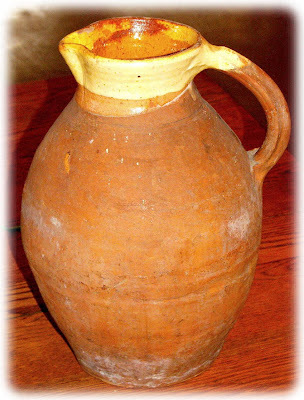 The jug has these subtle drippy/runny markings that you may pick up if you click on the image to enlarge. 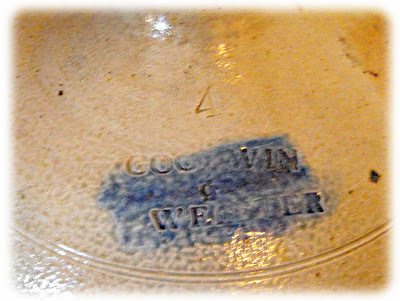 They're not just wine/food stains but are in the surface/salt glaze of the pot. Any ideas? 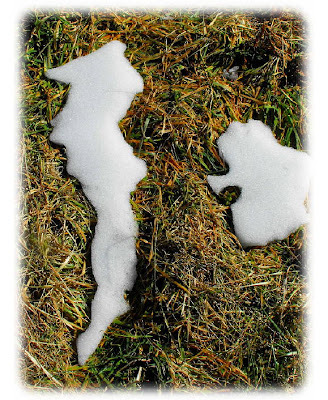 Here's a new feature for the blog, check out today's flashback post. 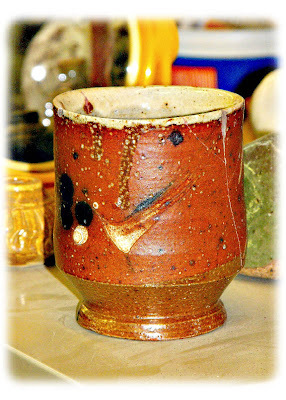 I'm still editing a slew of pictures to post tonight from Tom Turner's pottery collection. Any ideas what's going on here? 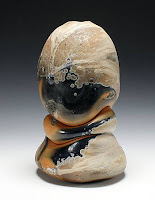 After publishing the previous post, I realized that I forgot to mention that Matt K is in a show at RedLodge Gallery with Brad Schwieger, Matt Long, David Hiltner, Jason Hess, James Brashear, Ted Adler, Dean Adams, and our wood-kiln-map guy, Simon Levin! After all, what would this blog be without mention of Simon!? The show is called INFERNO! 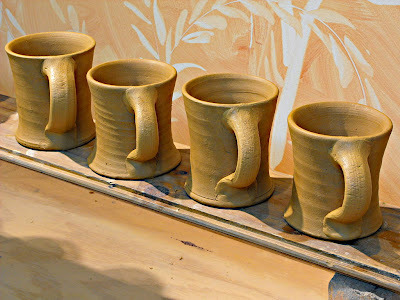 Here are some other pots from the show. Speaking of whom, Simon will be joining the Sawdust & Dirt columnists later this month, along with Mark Shapiro, Ayumi Horie, Don Pilcher, and Sam Taylor. More on this exciting news later.